Bins 1 and 2 support various plain, recycled or bond papers and glossy paper (16 to 68 lb., 60 to 256 gsm) in A3, A4, Executive, JIS-B4, JIS-B5, Letter, Legal and Ledger (Tabloid) sizes. The upper bin 1 supports up to 200 sheets of paper with hole punching. Bin 1 has a full sensor. 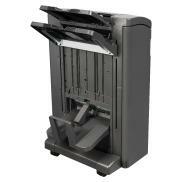 Bin 2 supports up to 2200 sheets of paper with stapling, hole punching and offset stacking. Each stapled set may contain up to 50 sheets for 4-position stapling (5,000 staples capacity). Supports Bin 2 has a full sensor. Bin 3, the lower bin, supports paper in A3, A4, JIS-B4, Letter, Legal, Ledger (Tabloid), Super Tabloid (12x18 inch) and SRA3 sizes. This bin, supports saddle stapling of up to 18 sets with up to 15 sheets of folded 20 lb. (75 gsm) paper per set. Bin 3 has a paper present sensor. The standard output bin capacity is reduced to 100 sheets when using a floor standing finisher. Bin 2 capacity is reduced when stapling is utilised. Hole punching and offset stacking are supported to Bin 2 only. The 2500-Sheet Tandem Tray or 2x 500-Sheet Tray is required to raise the printer or MFP to the correct height for use with the Finisher. Bin 3, the lower bin, supports paper in A3, A4, JIS-B4, Letter, Legal, Ledger (Tabloid), Super Tabloid (12x18 inch) and SRA3 sizes. This bin, supports saddle stapling of up to 18 sets with up to 15 sheets of folded 20 lb. (75 gsm) paper per set. Bin 3 has a paper present sensor. Bin 2 supports up to 2200 sheets of paper with stapling, hole punching and offset stacking. Each stapled set may contain up to 50 sheets for 4-position stapling (5,000 staples capacity). Supports Bin 2 has a full sensor.